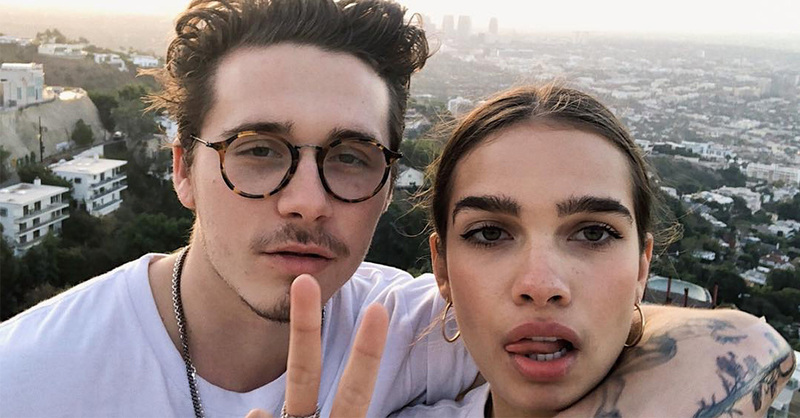 Who Is Brooklyn Beckham’s New Girlfriend? The 20-year-old aspiring photographer is dating 21-year-old model Hana Cross – and the two seem to be inseparable! The couple made things Instagram official in December after they had reportedly been dating under the radar for months. Then, Brooklyn posted a picture of the brunette beauty in January captioning the photo, “my beautiful girlfriend” to further confirm their relationship. The good-looking pair has already shared a few milestones together including romantic trips, public outings and meeting Brooklyn’s famous parents! In February, Hana and Brooklyn posed with Victoria Beckham at her AW19 show and Hana frequently rocks pieces from her line (scoring some brownie points perhaps?). The model also sat with the entire Beckham family along the catwalk during London Fashion Week and is followed on Instagram by the Spice Girls alum. Jealous? Same. It seems that Hana has been close with the family before she began dating one of the Beckham brothers, especially with Brooklyn’s cousin Libby Adams. And Brooklyn and Hana are clearly going strong! Just this past weekend, the duo drove out to Coachella together and documented their romantic weekend away together on social media! Hana posted a sweet photo with her love in front of the famous Ferris wheel and also snapped a pic with her man’s little brother, Cruz Beckham. On the way home, Hana also showed off her rapping skills as she and Brooklyn cruised back in their fancy whip. The duo also made sure to indulge on some In’N’Out too — hey, it’s post-Coachalla! While the duo’s relationship is new, it’s clearly on fire! Brooklyn broke things off with famous ex-girlfriend Chloë Grace Moretz in April of 2018 after nearly 4 years of dating on and off. After a messy breakup, it is clear that Brooklyn was ready for a good ole “thank you, next!” And that’s exactly what he got!